sharethis: This is one of the things that we all Indians have been waiting for and could have thought that this could be possible. Now here it is to everyone. 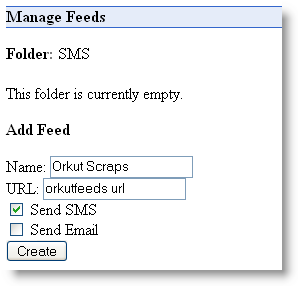 * Now a very simple way has been found through which you can get your ORKUT scraps on your mobile phones via SMSs. * No need of GPRS or WAP or internet connection on your mobile phones. * No need of a hi-fi mobile phone. * Just a simple cell phone needed which can receive SMSs. Thats it. * No charges involved. It is totally FREE. Its a combination of a free SMSs delivery client website and your ORKUT ID. 1. Login to your orkut account and click on your profile itself. You will get your orkut id on the address bar. Like http://www.orkut.com/Profile.aspx?uid=13902657719057040850 in my case. So 13902657719057040850 is my unique Orkut id. Note urs. 2. Now go to http://www.mytoday.com/ and register your mobile. This can only be done by sending sms REG to 9845398453. This will cost you 1 to 3 Rupees based on the operator. 3. Now Mytoday will send you your password to your mobile. 5. Click on the 'Manage' link under the heading Feeds. 7. Now put any xyz name of ur interest in the 'Name' field. 8. Now in the URL insert this link http://www.orkutfeeds.com/feed.php?uid=13902657719057040850 (in my case). Everything is same but you will have to change the 13902657719057040850 with your unique Orkut id which you created and noted in step 1. * This trick will not work if the scrapbook you are using is locked. So please unlock the scrapbook before doing this. * You will not receive the smss instantly. It could take over 3-4 hours for the scrap smss to reach your inbox. * This whole trick/process is for Indian cell users only. * The word limit is 71. So you wont get to read the full scrap if it exceeds 71 words.